What was Australia's 1967 Referendum about? The 1967 Referendum proposed to include Aboriginal people in the census. The 1967 Referendum proposed to allow the Commonwealth government to make laws for Aboriginal people. did not give Aboriginal people the right to vote. This right was already introduced in 1962.
did not grant them citizenship. By the time of the referendum, most of the specific federal and state laws discriminating against Aboriginal people had been repealed . was not about equal rights for Aboriginal people. The Constitutional change would not impact at all on laws governing Aboriginal people. However, campaigners hoped that a 'yes' vote would require the Commonwealth government to enact reforms which would eventually achieve better rights for Aboriginal people . Clever campaigners nonetheless understood to introduce these aspects into their campaigns and use them to favour a 'yes' vote. Gary tells what the referendum meant to a 21-year-old Aboriginal youth living in Sydney. Before Australia became a nation it consisted of separate, sovereign colonies (today's states and territories). For these colonies to form the Commonwealth a Constitution was drafted and each colony had to pass legislation agreeing to become part of the Commonwealth. Then they needed to hold referendums where all electors could have a direct vote on the issue. A 'Yes' majority was achieved at each referendum, which took place between 1898 (South Australia) and 1900 (Western Australia) , paving the way for the passing of the Constitution. Influenced by colonial views of the 19th century, the founding fathers of the Constitution incorporated sections which later ignited discussions which led to the 1967 Referendum. These were sections 51 and 127. "51. The Parliament shall, subject to this Constitution, have power to make laws for the peace, order, and good government of the Commonwealth with respect to:- [...]"
Section 51 meant that the federal government could make laws for anyone in Australia - except its Aboriginal population. Originally this clause was worded that way to enable parliament to make laws discriminating against racial groups like the Kanakas in Queensland . The words 'other than the aboriginal race in any State' were intended to exempt Aboriginal people from discrimination. Section 51 of the Constitution which excluded Aboriginal people from any federal laws . The 1965 prime minister Robert Menzies argued passionately against changing this section and held that if the phrase was removed the parliament could set up "a separate body of industrial, social, criminal and other laws relating exclusively to Aborigines". The inclusion of the words were thought to be "a fundamental safeguard against discriminatory Commonwealth legislation directed against [Aboriginal people]" . But as it stood the Commonwealth also had no power to make laws for the benefit of Aboriginal people. An important point of referendum supporters was that if the federal government, and not the state governments, make laws for Aboriginal people the laws which varied greatly from state to state  would become uniform, and they hoped for the benefit of Aboriginal people. Section 127 meant that when the population of the Commonwealth, of a state or territory is counted, Aboriginal people are not included. Section 127 of the Constitution which excluded Aboriginal people from being counted in a census . Until well into the early 1960s politicians feared that by counting Indigenous people this would affect the quota that decided the number of seats a state could hold in parliament. Hence the greater the number of Aboriginal people within a state, the greater the number of seats. This, it was argued, would give advantage to states with a great number of Aboriginal people  and it was feared that Western Australia and Queensland could lose a seat. The referendum that changed the Constitution was held in 1967, but this was just the culmination of events which started more than a decade earlier. Flyer advertising the meeting in the Sydney Town Hall at which the Aboriginal-Australian Fellowship's petition was launched. . In early 1957 the Grayden Report revealed that malnutrition, blindness and disease were all commonplace among the Aboriginal people of the Warburton Ranges region , about 300km west of the border between Western Australia and South Australia. Australia's shocked white population learned for the first time about the appalling living conditions of Aboriginal people whom they had scarcely heard of before. Concerned individuals formed action groups, one of which was the Federal Council for Aboriginal Advancement (FCAA) founded in 1958. To achieve equal citizen rights for Aboriginal people the FCAA wanted the Australian Constitution to be changed to enable the Commonwealth government to legislate also for Aboriginal people. The Aboriginal-Australian Fellowship ran a petition campaign in 1957 about the situation of the Aboriginal people of the Warburton Ranges. A year later the FCAA ran a similar petition which was signed by 25,000 people in three months . Both petitions called for the amendment of section 51 and the repeal of section 127. Both failed. In 1962 the Australian Labor Party opposition submitted an urgency motion seeking a referendum to include Aboriginal people in the census . Although the debate mainly focused on the redistribution of electoral seats in the parliament, the opposition also argued that "everything that can reasonably be construed as discrimination should be eliminated from the Constitution." The motion did not convince the government nor the press who claimed that "the practical reason for section 127 is rapidly disappearing"  because in 1962 fewer than 2,000 Aboriginal people still lived undisturbed tribal lives, and the covered message was that they would ultimately disappear entirely. From 1962 to 1964 more than 50 petitions were submitted to the government, all asking the same change: To change section 51 and to repeal section 127 of the Constitution. Part of this wave of petitions was due to the work of the FCAA who in 1963 ensured that over a seven-week period every day began with the tabling of petitions . It was a clever move: Instead of submitting one big petition presented only once and then filed, a new petition each day kept the issue alive. The FCAA managed to collect more than 100,000 signatures in favour of a constitutional change. By 1964 the constant tabling of petitions, the submission of Constitution Alterations Bills and Private Member's Bills seems to have had some effect on politicians' minds. Discussion if section 127 should be repealed or not shifted to when it should happen and the costs of a referendum . In the second half of 1965 Prime Minister Sir Robert Menzies announced his retirement for 1966. Referendum announcement in November 1965. .
On 11 November 1965 it was announced that a referendum would be held on 28 May 1966 seeking approval to increase the number of members in the House of Representatives (to match the growing population) and, among others, to repeal section 127 . No mention of section 52 at this time for the government was still convinced that it protected Aboriginal people rather than discriminated against them. The previous 12 referendums included 26 proposals, four of which Australian voters agreed with but 26 they rejected. Consequently the Prime Minister must also have feared that if he included too much change, Australians might have rejected the referendum altogether and with it the increase in the House of Representatives. 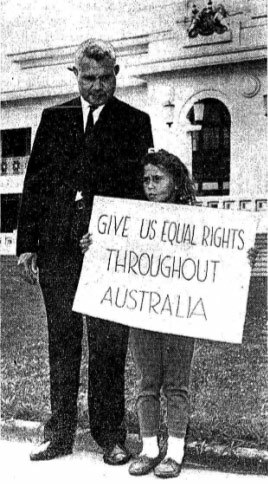 J Hassen and daughter protesting outside Parliament House in Canberra. .
Liberal backbencher W. C. Wentworth campaigned strongly for the amendment of section 51 of the Constitution. He argued that by enabling the Commonwealth to make laws for the Aboriginal people these would be for their advancement. State laws would not be affected by Commonwealth legislation and states could receive federal funding . Wentworth's bill was later supported by teachers of the Sydney University. But Wentworth's efforts seemed doomed. A private member's bill Wentworth introduced to government in March 1966 was not put to a vote and subsequently lapsed . In 1965 the FCAA was renamed to Federal Council for the Advancement of Aborigines and Torres Strait Islanders (FCAATSI) to include Indigenous people from the Torres Strait. It took over responsibility for keeping the constitutional amendment issue politically alive. On December 1st, 1965 a group of 36 Aboriginal people went to Canberra to protest about clause 26 of section 51 . Outside Parliament House they showed placards while they lobbied Members of Parliament inside, including Mr Wentworth. Among the protesters were famous names like Faith Bandler (FCAATSI NSW State Secretary), former Australian Rules footballer and boxer Charles Perkins and Brisbane poet Kath Walker (later known as Oodgeroo Noonuccal). After Prime Minister Harold Holt took over power from Robert Menzies in 1966 he decided to postpone the referendum that year. His newly elected government was too occupied with the "many important and pressing matters arising at home and abroad" , the former alluding to a general election later that year, the latter to the war in Vietnam. Behind that reasoning was also the fear that if the referendum failed, it would be a blow for the new government. On February 23, 1967 the federal cabinet finally decided to hold a referendum in May that year . A few days later Prime Minister Holt announced that the referendum would go further than the previous draft. Now also clause 26 of section 51 should be amended and the words 'other than the aboriginal race in any State' dropped . This must have come as a great victory of W C Wentworth's long campaign which seemed to have reflected the general public opinion that these words were discriminatory. But while Wentworth had argued for a replacement of these words with a new phrase that would advocate positive laws for the advancement of Aboriginal people, Holt went for a mere deletion. On March 2nd 1967 Prime Minister Holt introduced legislation for a referendum to be held on May 27, 1967. In April, FCAATSI organised a deputation to Canberra to seek support for a 'Yes' vote on the Aboriginal question . FCAATSI feared that voters would not understand the effect of a 'yes' or 'no' vote and wanted to check on what politicians had done in their electorates to support a 'yes' vote. FCAATSI was helped by the heads of churches who also supported a 'yes' vote, distributed how-to-vote cards and tried to explain to voters what it was all about. 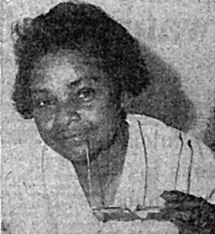 Faith Bandler FCAATSI campaign leader, feared that many people voted 'yes' because they believed the referendum gave Aboriginal people the right to vote. . Acceptance as a person. Dixon felt that up until the referendum Aboriginal people had not been seen as "human beings". Fear of apathy, ignorance, complicated ballot paper and racial hatred which could cause a 'no' vote. This would mean "bad blood" between black and white for "the foreseeable future". It's too late. Dixon thought that it didn't matter "if and when [sections 51 and 127] go" since "it's too late to heal the scars of years of discrimination". Special laws for the benefit of Aboriginal people which the government will make. A unified law. For too long an Aboriginal person would break the law somewhere purely by moving around as a citizen or to "exist on that very spot", because each state had its own laws governing Aboriginal people. More funding. With the Commonwealth in charge of Aboriginal laws, Dixon hoped that funds or trained personnel would help policies work. An Aborigines' Bureau staffed by Aboriginal people and looking after Aboriginal affairs. Was the term they used? Nola Gregory wrote this poem for the 50th anniversary of the 1967 referendum. Read more Aboriginal poems. 1962 The Commonwealth Electoral Act is amended to give the right to vote to all Aboriginal people. 1966 Stockmen and women at Wave Hill walk off in protest against intolerable working conditions and inadequate wages. 1966 Charles Perkins leads Freedom Ride by Aboriginal people and students through NSW in support of Aboriginal rights. 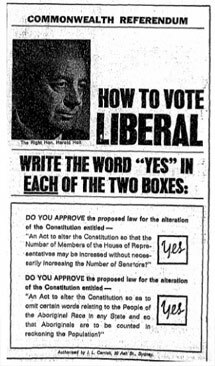 1967 Referendum ad by the Liberal Party. On May 27th the public was still largely confused on how to vote correctly. This ad tried to help voters decide . In what is a twist of history Aboriginal people who were entitled to vote in the Northern Territory and Australian Capital Territory were not entitled to vote in a referendum according to the Constitution. This prevented around 3,000 to 4,000 Aboriginal people in the NT from voting for their own cause. In 1967 it was estimated that between 8,000 and 10,000 Aboriginal people were registered to vote throughout Australia . For the referendum to pass it was required that the question was supported by a majority of voters in a majority of states, in 1967 that meant about 2.5 million 'yes' votes in four states (the 'territories' were not eligible to vote, i.e. Northern Territory and ACT). Jack Horner, member of the Aboriginal-Australian Fellowship, remembers the night the votes were counted : "On the night of 27 May 1967, Jean [his wife] and I were in the tally room at Circular Quay, in Sydney, and we couldn't believe it as the results were consecutively dropped onto the calculating machine. Those results exceeded our greatest expectations, and everyone's—it was the triumph of an appeal to the sense of justice." On 10 August 1967 the act changing the Constitution became law in Australia. The Constitution of Australia never has, and to-date still does not, protect basic human rights or offer protection against racial discrimination. Referendum question: "Do you approve the proposed law for the alteration of the Constitution entitled 'An Act to alter the Constitution' so as to omit certain words relating to the people of the Aboriginal race in any state so that Aboriginals are to be counted in reckoning the population?" * Residents of the Northern Territory and the Australian Capital Territory did not have the right to vote in referenda at that time. The heaviest 'no' voting came from country electorates (e.g. 18% in northern NSW). It was the biggest 'yes' vote in history on any Commonwealth referendum to-date. The previous greatest 'yes' vote was in the 1906 referendum (to enable senate elections for both Houses to be held concurrently). In the WA electorate of Kalgoorlie more than 28% of votes opposed the proposal. The proposal on Aboriginal people was only the fifth to be carried since Federation. The 'no' vote was most dominant in states that had the largest Aboriginal population and have been criticised most for their treatment of Aboriginal people. Up to 1967, in 60 years only 5 out of 26 referendum questions have been carried. The 1967 Referendum: Race, Power and the Australian Constitution explores the legal and political significance of the referendum and the long struggle by black and white Australians for constitutional change. It traces the emergence of a series of powerful narratives about the Australian Constitution and the status of Aboriginal people, revealing how and why the referendum campaign acquired so much significance, and has since become the subject of highly charged myth in contemporary Australia. Attwood and Markus's text is complemented by personal recollections of the campaign by a range of Aboriginal people, historical documents and photographs. Movie: Vote Yes for Aborigines, a documentary by Aboriginal woman Frances Peters-Little covering 100-year-plus lead-up to the referendum, questions the referendum's success and explores the social attitudes and influences of those times and since. 'Vote Yes for Aborigines' draws on rarely seen archival footage and attempts to answer the question of what came of the 1967 Referendum. The Australian Broadcasting Corporation prepared a documentary for the 50th anniversary of the 1967 referendum called Right Wrongs. It offers personal stories, opinions and historical recordings of what happened and asks "How far have we come since 1967?" Chapters include life for Aboriginal communities before the vote, finding their voices and standing up for their basic human rights, campaigning and activism leading to the referendum, and what has changed, what has stayed the same, and the legacy of the referendum. What was the effect of the 1967 Referendum? Did the federal governments act to the expectations of Aboriginal and non-Aboriginal people who so passionately had fought for the Constitution to be changed? Sadly this hasn't been the case. The government at the time didn't expect a 'Yes' vote and, two months after the referendum, still had no idea how to use the new powers it had been given. While then-Prime Minister Harold Holt is said to have had a genuine interest on improving Aboriginal affairs, "all hopes that the referendum would result in positive change drowned with him"  when he never returned from a swim in the ocean. The next government with PM John Gorton was disinterested and not motivated to take action, and it seems this attitude still lingers today. Governments of all political colours continue to 'forget' to consult with Aboriginal people during law-making business. In 1998 the High Court had to decide on a case which addressed the changed sections of the Constitution. Despite the changes, the government was allowed to pass a law that was detrimental to, and discriminatory against, Aboriginal people . In the Hindmarsh Island High Court decision Justice Kirby made it very clear that Section 51 (xxvi) can be used to the detriment and not always for the benefit of any race. As Aboriginal people realised that the promises of the constitutional change were not going to be met, they started to organise and to protest: The Tent Embassy was established and the modern land rights movement was born. But these are other stories. Although the 1967 Referendum has failed politically, historically is was, and remains, a triumph of the human spirit that continues to inspire generations of Indigenous and non-Indigenous people alike. It is one of the glowing coals that keep the fires burning.